The First Congregational Church of Ann Arbor, Michigan, was organized and established on March 23, 1847. The church was formed when its first members split off from the local Presbyterian church, both on the issue of slavery and over certain doctrinal positions. The early beginnings of The First Congregational Church of Ann Arbor can be traced to a log school built by John Allen on the northwest corner of Third Street (now Main Street) and Ann. Worshipping together at this location were Catholics, Baptists, Episcopalians, Methodists, Unitarians, and Presbyterians. In cold weather, services were held in private homes. First the Presbyterians, and then Methodists, began taking seats apart and finally holding services at a different time from the others. On February 9, 1847, forty-eight members of the Presbyterian Church, who had roots in Congregationalism, were dissatisfied with the Presbyterian form of government and disagreed with the Presbyterian minister who would not renounce slavery. This group met to begin formal steps toward severance and to select a site for a new church. Two weeks later the lot selected was purchased for $600. 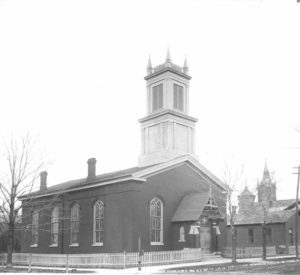 The newly built Congregational Church building on the corner of Fifth and Washington Streets in Ann Arbor was dedicated on June 21, 1849. By 1851, the church had 113 members. Two years later the church adopted a resolution against slavery, excluding from membership and as ministers any slaveholder or advocate of or apologist for slavery. 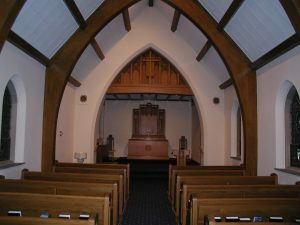 As membership grew, a resolution was passed to build a new church building at the present location at the corner of State Street and William Street in Ann Arbor. The cornerstone was laid on June 23, 1872. On May 10, 1876, the present building was dedicated. The Douglas Memorial Chapel was built between 1951 and 1953 at the same time as the Parish House addition was being built. The Memorial Chapel is a Gothic building, seating 75. There are heavy oak trusses, a carved oak altar and lectern, and stained glass windows. Originally there were cathedral chairs in English beech made in London, England. The pews replaced them in 1999. The communion table was purchased in 2006. The baptismal font is made of Vermont white marble. 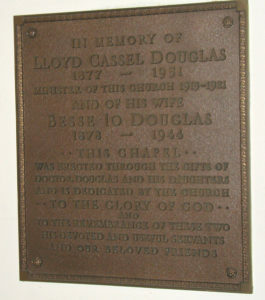 The Memorial Chapel is in memory of Dr. and Mrs. Lloyd C. Douglas. Dr. Douglas served as minister of this church from 1916 to 1921. Lloyd Douglas also wrote books, among them, The Robe and The Magnificent Obsession. The chapel is open to the public weekdays from 9 a.m. until 3 p.m., giving people a quiet place for meditation. On Sundays at 9:30 a.m., we have a weekly 15- minute chapel communion service. Outside the chapel is the church’s Garden of Memory. Church members’ ashes are interred here. 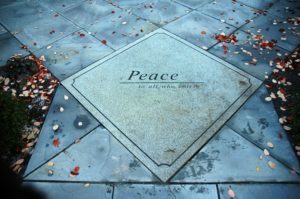 With its landscaping, fountain, and benches, the memorial garden offers people an outdoor place of peace and beauty. 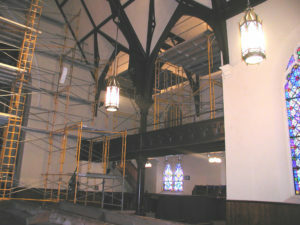 The sanctuary has had two sets of stained glass windows. The original windows from the early 1870’s, were designed to let in light because the sanctuary was not electrified until 1900. Previously, gas lights illuminated the sanctuary dimly. 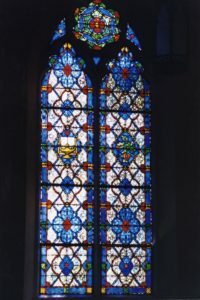 The first translucent windows had diamond patterns in them, bordered by red and blue glass. Sections of these windows currently hang in the Mayflower Room and the ministers’ offices. Only one original window remains in place. It can be seen only from the exterior because it was walled in inside. As you exit the building out the William St. double doors off the Mayflower Lobby, turn around and look up at the apse. You will see this window. The windows we have now were installed in the 1940’s and early 1950’s. They also contain primarily red and blue glass sections which surround symbols of the Christian tradition. 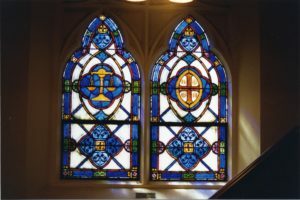 Stained glass windows outside the sanctuary tell the story of the birth of Congregationalism as well as scenes from American history. 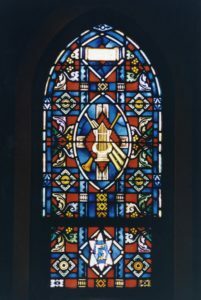 These windows are in Pilgrim Hall and the two lobbies by the elevator. 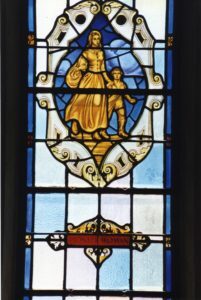 The Doulas Chapel windows contain medallions from the study of Lloyd Douglas. The windows tell the stories from Dr. Douglas’s books.